Hello, welcome to all who are always with us and if you are new here, welcome and I hope you enjoy our patterns and do beautiful work. Here on our site you will find many things, easy patterns and also advanced level, clothes patterns, shawls, shoes, decorations, bedspreads, rugs, squares, amigurumis, baby clothes, videos tutorials, graphics, tips and more. After a look at our website and enchant with the pattens of work that we make available. Having you here is a pleasure because that's why I leave patterns available here. We always have to be looking for novelties to practice more and more, and I'm sure that here you will find patterns that will help you improve your skills and have more knowledge. I was looking for something on the internet that many are looking to crochet and saw that many like to make carpets, especially the beginners, so thinking about that I separated a pattern of crochet rug to share with you today. If you also like crochet rug or have a lot of demand and sale of carpets then do not miss this pattern, get your materials and let's learn. Today we are going to learn more a model of lovely crochet rug with flowers of measures of 82 × 52. The crochet is simply charming, each piece ready is a feeling of satisfaction and will to do more and more is not even, I am so, every Once I finish a pattern I'm already happy with the result and I always want to do more. The craft with the crochet is very beautiful and has a way of varying the pieces very large so may be more original each time. Crochet is used as a pastime, as an extra income and also indicated to improve health. Many people like to crochet to decorate the house they can make the color they want, others like the clothes and accessories and others like everything that exists crochet like me. Crochet rugs can be made of varying sizes, colors and decorations. He is able to renew his environment and leave more cozy and with his face. I have separated this pattern that is the one shown in the picture above the work ready to share with you and to be enchanted like me. This pattern is of beginner level and is perfect with your crochet details, if you are starting to invest in patterns as well, easy, well made and beautiful as this one of flowers. And with the sales the more differentiated and detailed my success you will have with your sales and more orders appeared. 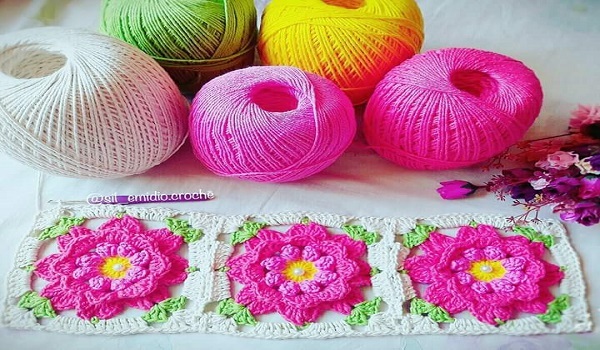 This crochet rug is lovely to have beautiful flowers, so the name is carpet enchanted, can make the color you prefer, enjoy your stored yarn to make the flowers. It is done in a single layer by faster working. Increasingly this is in the trend of the crafts of the make yourself used in decoration without spending much as the crochet. If you like this pattern of enchanted crochet rug, do not waste time, take your materials and start now and make the colors you prefer. Below are the tutorial videos of how to do step by step is just put the legend of the language you prefer and do not forget to enjoy our page on facebook Xell Crafts and until next time.